GETTIN' LOONIES MINI-TOUR BEGINS! / J'OBTIENS LES LOONIES MINI-TOURNÉE COMMENCE! Neato! / Formidable!. Hey Canada! Your dollar may be down to 96.28 US cents, but I still wants me some. Plus maybe some free health care and a little Tim Horton's. So, to get my fill of Canadian stuff, I suppose I have to do some gigs while I'm up there don't I? Fine. 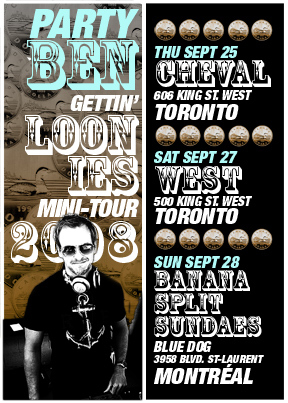 I'll be doing some gigs at a couple King Street hot spots in Toronto an Thursday and Saturday nights, then hopping up on the always-friendly Air Canada to Montreal for a Sunday night gig at Blue Dog. While I've been to Toronto for some DJ fun times before (and was overwhelmed by their bonkers hands-in-the-air attitude), this will be my, ahem, Quebec debut, and I'm very excited to inflict the rudimentary French I picked up on the Gettin' Euros tour on unsuspecting Montrealites. For details on the gigs look over on the right column or go to the Events page. Oh, and here are some new and not-so-new items people have been asking about. They're not really worth commentary, but hey, at least I'm posting stuff. 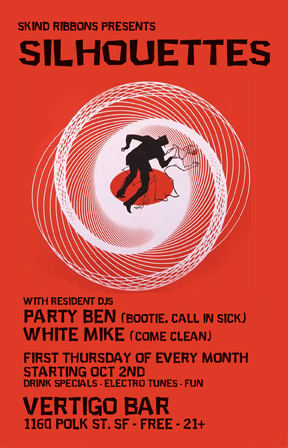 Queen vs. House of Pain vs. Go Home Productions - "We Will Jump You"
Earth Wind & Fire vs. Flo Rida - "Low Groove"
Party Ben's Quebec debut at this Sunday night Team Canada-affiliated hotspot! FUN PARTY TIMES ON POLK STREET! !